Question: What is the best night of the week? Answer: Thursdays. Every other night is stupid. 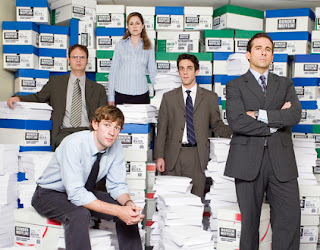 The author of this blog has recently added video clips entitled "The Office- Greatest Moments" . Well, as the Assistant Regional Manager of Dunder Mifflin Scranton branch, I say that as funny as those clips are, they don't do justice to what were truly the greatest moments in our history. Those of you who have never watched our show before, I expect to see you on NBC this Thursday night at 9pm or disciplinary action will be taken. *Disclaimer: the law of nature requires that as soon as I recommend a tv show to anyone the next episode will be unusually offensive, raunchy, and obscene... it's not usually, I promise. 10. When Jim left the Scranton office. "Ohhh, noooo, Jim's gone. What are we going to doooo? FALSE. I do not miss him." 9. When Michael told Toby that he hates everything about him. No one can explain Michael's hatred for Toby... but it's funny. 8. The day I unveiled my ingenious idea for a new consequence-reward system around the office: Schrute Bucks. 7. The day Pam was in tears in the hallway and I alone was there to console her. Upon approaching the crying victim, I quickly asked "Who did this to you? Where is he?" After a moment of silently listening to her sobbing, I calmly diagnosed the problem: "So you're PMS'ing pretty bad right now, huh?" 6. The day my computer challenged my sales ability and I defeated it. My computer started typing these messages to me, things like: "While you were reading this, I researched everything in the world and learned everything there is to know, and oh yeah, in that time I also sold more paper than you." But Michael and I were ultimately victorious over our cyber-foe when we delivered gift baskets to our former clientèle... that is, before Michael drove the car into the lake following the GPS' instructions. 5. "Diversity Day." Michael came up with this brilliant idea to help us appreciate diverse cultures. Each person had a post-it note on his/her forehead with "Jewish" or "Asian" or "Black" or something similar written on it. It was then the role of the other office members to talk to that person about himself/herself using descriptive statements about that point of view or nationality. Toby was ticked, but Michael's a genius. 4. The day Michael hit Meredith with his car. And then a couple weeks later, when Meredith asked Jim to sign her pelvic cast. (Meredith: "Thanks. I'll read that later.") Meredith is creepy. 3. Jim dressing up like me. Impersonation is the highest form of flattery, so I thank you, Jim. 2. The day I neutralized an assailant with my pepper spray. "For two years, I've brought pepper spray with me to the office and was laughed at... well who's laughing now?" I thank you for reading. Post your favorite moments of the show if you wish. On behalf of all of us here at Dunder Mifflin, I bid you adieu. Any scene with Creed in it! #2 Walking over to the gift table at the wedding, ripping a card off one of the presents and sticking his own card in its place. #1 "I am not offended by homosexuality. In the 60's, I made love to many many women, usually outdoors in the mud and the rain- aaaand it's possible a man slipped in... there'd be no way of knowing."